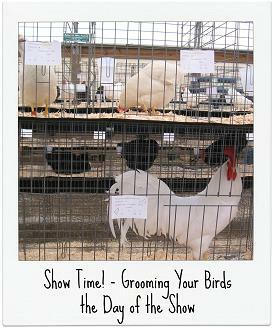 The entry form has been sent, the blood testing is done, it's the week of the show - it's spa time for the chickens! 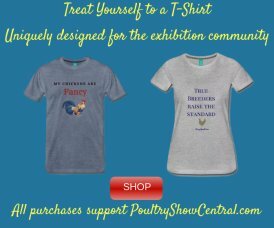 I'm always amazed at all that needs done the week before a poultry show. 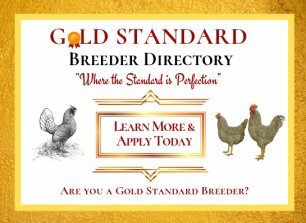 Every show we've attended we have learned more efficient ways to get the birds looking their best, sometimes it has been by learning the hard way. Hopefully you can learn from our mistakes and our successes as we give you a glimpse at what the week before a show looks like on our little farm. One thing you can be sure of is, a dirty chicken does not win shows. Even when the birds look pretty clean, they will look much more stunning after a little spa treatment. The first decision is when and where the washing should take place. 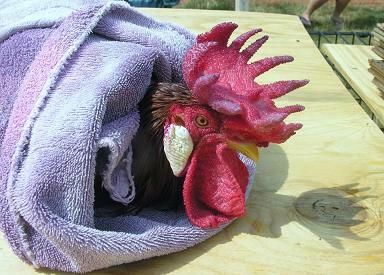 You want to get your chickens cleaned early enough that the oils that are removed by the soap can be fully replenished. At the same time, we have learned the hard way that if you clean them too early in the week, you'll have some hefty clean-up to do the day of the show, especially on their feet, even if they are put in clean pens after they are washed. We have found that Wednesday or Thursday is best before a Saturday show. In our house, the best location for the baths are in the back room of our house because we have access to warm water and we have a deep utility sink. You also need 2 rinse buckets which could be as simple as 5 gallon buckets if you don't have large breeds or a plastic tote if the extra size is needed. We use the sink with the drain for the soapy washing because we often need to change the water between birds. The first rinse bucket should have a few splashes of apple cider vinegar in it so the soap is fully rinsed from the feathers. The final bucket has just clean, warm water to rinse the ACV. Now to get the chickens to the house! 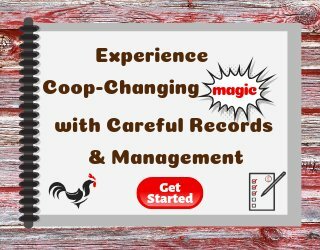 That doesn't seem like a difficult task but for us, since the coop is a bit of a walk from our house, it accounts for a significant portion of the time needed. 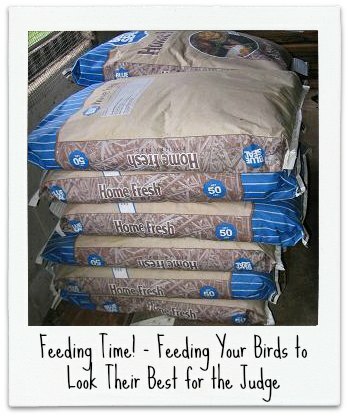 We have found the best method for us is to set up several show cages on the grass outside our back door and get all the birds needing cleaned into the cages before we get started. If you don't have show cages, you may have to get creative or just make the hike back and forth between birds. Once we're all set-up inside, we get our first chicken, talk soothingly to it as we ease it into the warm (not hot or cold!) soapy water, being careful they don't get their head under the water. We find the chicken usually calms down and relaxes but don't count on it. 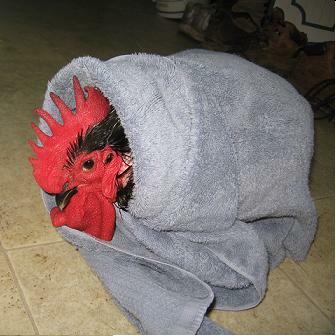 A flapping, wet chicken can soak down a room (and you!) rather quickly so keep your hand on their back while you wash them. 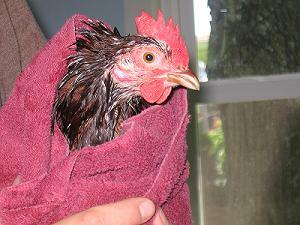 We wet the chicken in the soapy water, paying special attention to their vent and their feet. Remove any poop stuck to the feathers around the vent, being careful not to pull feathers out if possible. By all means, check for mites and if they have any, spend plenty of time washing them away and treat them afterwards with Frontline or your mite treatment of choice. Check carefully for dirt on the combs and waddles, in the ears or around their face. Use a soapy toothbrush to gently scrub where necessary. The muffs of our Ameraucanas always need some attention. We use the toothbrush to comb out any dirt. If the upper mandible of their beak is too long, clip it with the nail clippers so the top and bottom are even. We find them quite adorable at this stage and my daughter can rarely resist taking a picture of the poor things. Since they are so incapacitated, you can let them sit for a bit to dry if you'd like. I always hope and pray that the weather on chicken washing days is sunny and warm because it makes the next step, the drying process, so much easier. On a sunny day, after a good wash the chickens go back to their grass-bottomed show cages to dry in the warm sunshine. The benefit of the grass is that you can move them around if the bath inspires the chickens to leave a messy pile that could ruin all your hard work. The sun and a warm breeze does a remarkable job at drying the birds. Unfortunately, the weather does not always cooperate so nicely. If the weather is wet or especially if it is really cold, you will need to set up a space in the house for the birds to dry slowly. If you get really ambitious, they enjoy the hair dryer but you'll want to keep the dryer on low so it's a long process and most birds actually look better if they can dry and preen without the hot air. When the weather is cool, we have tried various methods, even letting them range freely through the house (a messy option and not one I recommend!) 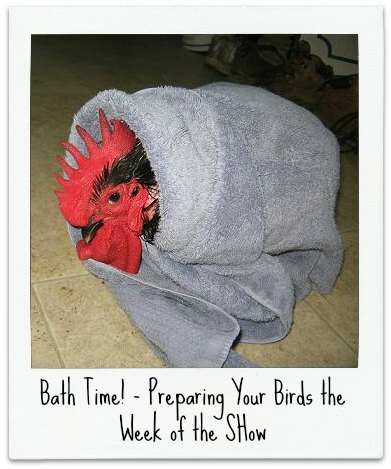 Our most successful method has been to set aside a corner of our backroom with towels or newspaper on the floor and a heat lamp (and sometimes a hanging hair dryer on low) and wash just a few birds, allowing time for them to soak in the heat and dry most of the way before we move them back to their clean coop. This method definitely takes longer because you will need to wash them in "batches" unless you have a large area for drying. And yes, it really is important to have a clean pen because otherwise the dust and dirt will stick to their newly cleaned yet still damp feathers. They're not ready for the show yet, they will need the final "make-up session" the day of the show, and we discuss that here. 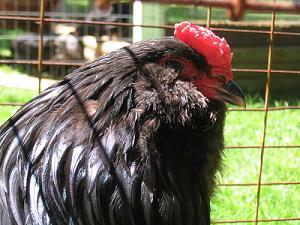 So how do you get your chickens dry during the cool, rainy parts of the year? 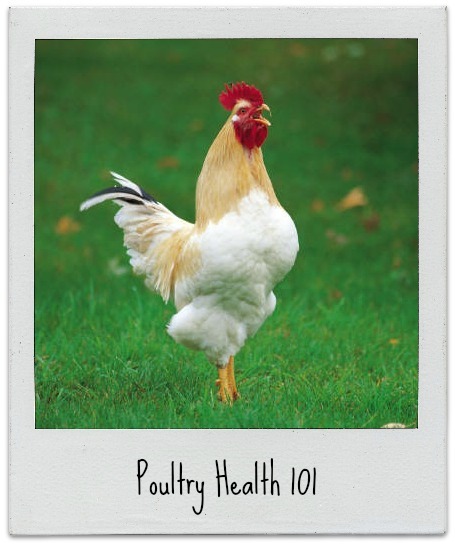 Or maybe you don't have chickens but have another kind of poultry. I would love to get a peek at the week before the show at your little farm. Would you be willing to share with us? Please do! 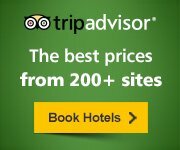 Your story will appear on a Web page exactly the way you enter it here. (We will review it before it gets published). 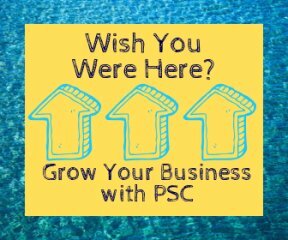 We can't wait to learn from you! Preparing for a show. Silkies and Cochins. 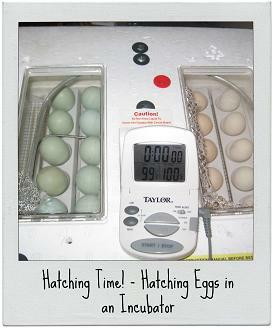 Here are some pictures of the chicken dryer that I built. Hope you enjoy.